Calling all Uptown fishermen. There’s something different going on in the underwater Uptown world. No need for rods, tackles or hooks. You won’t even need to mess around with worm bait! All you need is your speargun and prepare to harpoon for wins in Scuba Fishing! Deposit $25 to try out this exciting new All Ways Pays slot where marlins and sharks help you amass wins! Claim them with Free Spins, Multipliers and Wild symbols that will have you diving deeper and deeper for serious winning combinations. 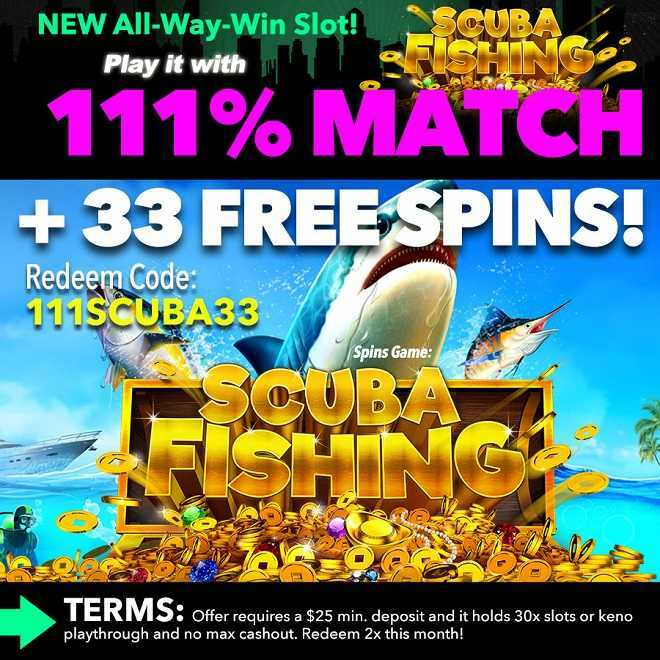 Enjoy the adventure of diving for underwater wins in Scuba Fishing with a 111% Match + 33 Free Spins! Offer requires a $25 min. deposit and it holds 30x slots or keno playthrough and no max cashout. Redeem 2x this month! Panda's Gold is our exotic new slot which plays at 88 lines for a 50 line bet and Panda Magic is an amazing All-Ways-Pays game in which the protagonist is an old Panda Wizard that is ready to impress you with crisp 3D graphics and tons of bonus features!! Please note that both games will grant you Double Comp Points throughout the month so the more you play the more comps you earn to redeem in cash! Deposit bonuses require a $25 minimum deposit and they hold 30x slots or keno playthrough + 10x roll over on spins winnings and no max cashout. 200FREEPANDAS coupon winnings holds $500 max cashout. Promo codes must be redeemed in order. Offers expire on October 15th. Turn a Good Chance into a Small Fortune! Ever wonder if you can improve your luck? Fate is not paranormal in nature; it’s about taking a good chance and turning it into a small fortune! For some people, good luck comes naturally. 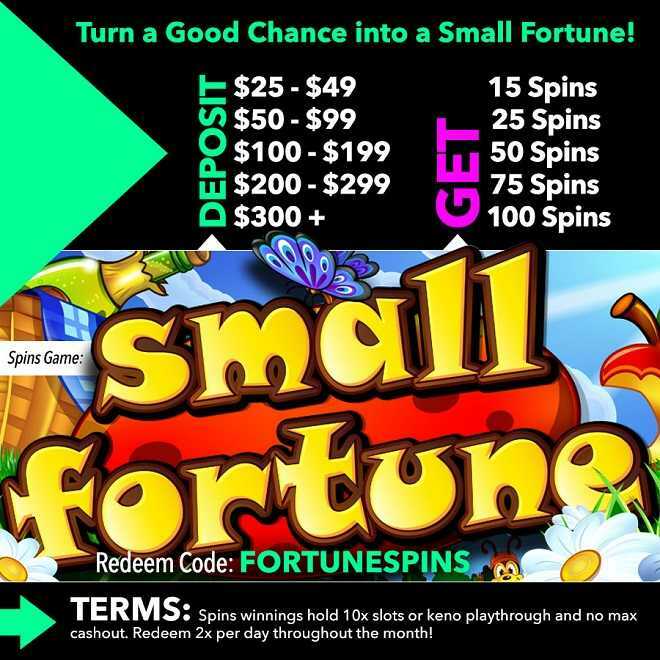 For you, it comes when spinning Small Fortune with up to 100 Free Spins when you deposit as little as $25! Try your newfound luck this September and change the course of events by collecting a Small Fortune! $25-$49 15 Free Spins on Top! $50-$99 25 Free Spins on Top! $100-$199 50 Free Spins on Top! $200-$299 75 Free Spins on Top! $300+ 100 Free Spins on Top! Spins winnings hold 10x slots or keno playthrough and no max cashout. Redeem 2x per day throughout the month! Been Naughty or Nice this Summer? Have you behaved this summer? Christmas will soon be here – sooner than we think, and Santa has seen all your moves and wants you to celebrate early by playing with a 100% Weekly Match + 75 Free Spins! It truly doesn’t matter if you’ve been Naughty or Nice this summer. All that matters is you spin for wins with help from the Wild Naughty or Nice, huge Multipliers, and a Free Games Feature. Summer has come to an end – it’s time to prepare for early holiday celebrations with Uptown wins! 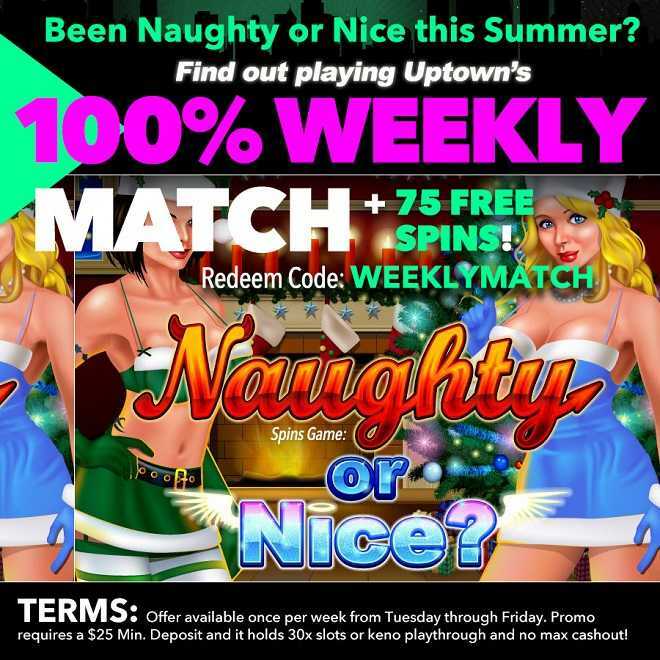 Find out if you’ve been Naughty or Nice playing Uptown’s 100% Weekly Match + 75 Free Spins! Offer available once per week from Tuesday through Friday. Promo requires a $25 Min. Deposit and it holds 30x slots/pokies or keno playthrough and no max cashout! Did you know that every time a child says, 'I don't believe in fairies,' there is a fairy somewhere that falls down dead? This September, let your inner child run free and bring fairies back to life with Stardust wins and up to a 225% Match + 50 Spins! 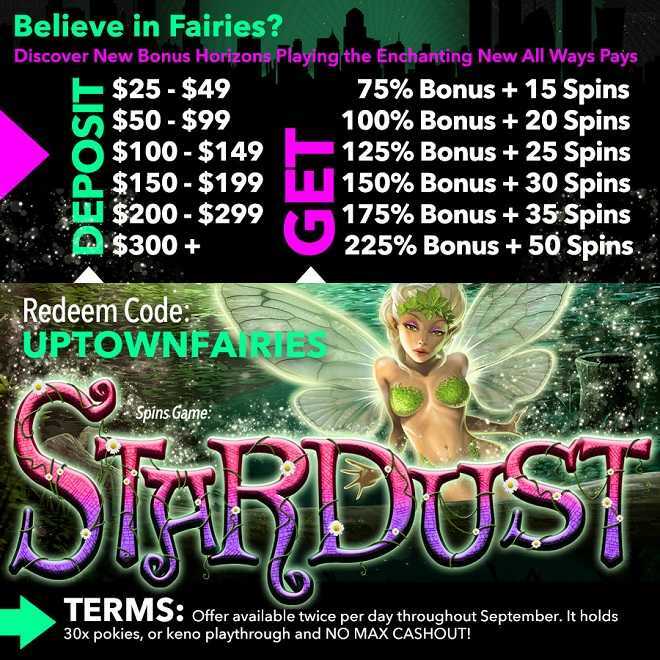 Stardust is Uptown’s new all ways pays slot that’s packed with magic, green and blue pixies, wilds, bonus features and multipliers that will increase your chances of believing again! Magical dust and winning combinations are flooding the Uptown reels this September when you spin Stardust! Offer available twice per day throughout September. It holds 30x slots, or keno playthrough and NO MAX CASHOUT! Adventure Begins With September’s Bonus Expedition! Stardust and a Supercharged Bonus Spin! Fire the Luck of Uptown’s Dragon Free Spins! Copyright © 2017 Uptown Aces. All Rights Reserved. You must be at least 18 years of age to play.